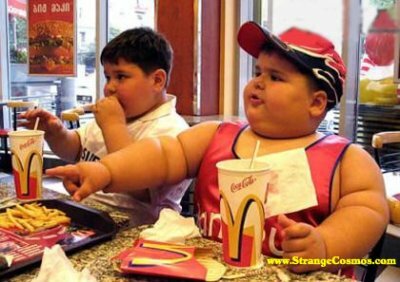 THE STORY: Basically, what happens is that these guys are being turned into zombies by eating to much fast food. Super Vegetable Guy Thingy Abober has to save Village and Other Village by shooting a vegetable-powered gun that gives the zombies the nutrients they need to reverse the effect. THE OBJECTIVE: You have to stop the zombies by shooting the power of vegetables into them and find the Main Apple Supply to save Village and Other Village. THE TEAM: Benjamin and Jacob have joined forces to create this game and became Team Ninja Kitten! THE LESSON: Did you know fast food contains chemicals that can induce cancer and mental problems? They also have many other dangerous effects. So, if you eat fast food, it doesn't mean you can workout a bit and the problems of fast food will go away. It just means that you burnt the calories from it but not the chemicals that have entered your blood stream. Also, the wrapers have chemicals on them that get rubbed on the food and get into your body. Also, the fast food companies put chemicals that make a bit more addicting. So fast food isn't just fatty, it can be dangerous.